I didn't know what race to sign up for so I just googled and found a schedule of local 5K runs. 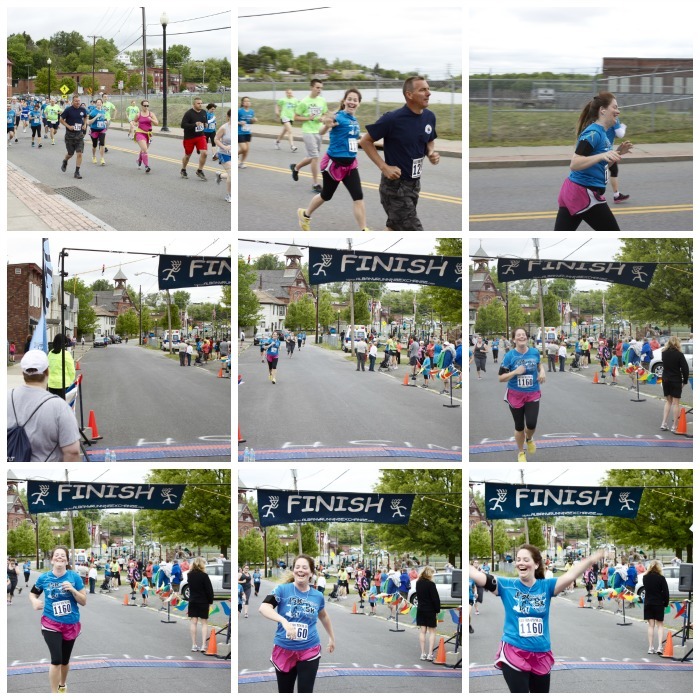 The Mastodon Challenge in Cohoes came up for Sunday May 19th, a week to the day after I completed Ease Into 5K. So I did it. I paid the $25, registered and picked up my bib the day before. Caleb and I drove around with the kids to try to get a feel of how the race would be (re: how hilly it was). Note to self: Next time do this before you actually sign up for a race. Hilly might be the understatement of the century here, folks. But, I didn't realize the magnitude of this situation until I was running it. Sunday morning came. I slept pretty good the night before. I got up around 5 AM and showered and ate half a banana. We dropped Story off with my mom and picked up my dad to come with us. We got there way too early and the boys played at the little park. I didn't feel that nervous until about thirty minutes before the race started. I waited in line at the porta pottys to pee before it began and all these really fit women were talking about how hard the 5K was the year before and the hills! Oh, the hills. Shoot, I thought to myself. What had I done? I made my way up the hill to the starting line. All the sudden everyone around me seemed to be A) a buff man with no shirt B) a bikini bod mom pushing several children in a stroller or C) an elderly person. So that was pretty awesome to look around at. For a quick second I asked myself what I was doing here. But then I remembered. I popped my headphones in, cranked up my music, and tuned it all out. TWO MINUTES! They shouted. Heart racing a bit now. These photos are terribly unflattering but I don't even care. It was on. Everyone was running, finding their pace. I got out of breath at first because I was running faster than normal and trying to keep up with The Jones'. But The Jones' ran on and I eventually caught my breath. I felt a tiny bit insecure in the beginning. I wanted to look back and make sure someone, ANYONE, was behind me. All the stroller moms were passing me, grandmas and grandpas were passing me, and I wondered, for a minute, if I was indeed the slowest women in the world. But that didn't matter at all. I had two goals for this day, for this race. 1: Finish the race. 2: Run the whole time. I believed I could do this. I knew I could do this. I have to pause and take a minute to thank the artists who made this possible for me: Katy Perry: your angsty songs motivate me in strange ways, and when the chorus of Hot N Cold comes on, I feel sort of unstoppable. Taylor Swift: it was fun to pretend I was you, telling one of your many ex boyfriends that we are never getting back together. Ever. One Direction: I don't even know who you are but you make me feel beautiful. Colton Dixon: You are the reason that I cry and raise my hands to Jesus while running. And last but certainly not least, Christina and Pitbull(? ): Thank you for letting me feel the moments. Most of the race was just focusing on one foot in front of the other. The hills came and they felt like mountains. I was certain that my goal of running the entire race was going to slip through my fingertips, but I didn't let it. It was slow, it was treacherous at times, but I did it. There were mile markers along the way that I didn't want to see in the moment, but looking back on it, I am glad that they were there. They let me know how far I had come and how much was ahead of me. I kind of want mile markers everywhere in my life now. After about two miles a gnat flew into my eye. I thought was going to lose my contact, that was a bit of a distraction. I kept running while rubbing my eye though. And, soon after, came the moment where I picked up my pace a little bit, this was the moment where I started to enjoy this race. I WAS DOING IT. 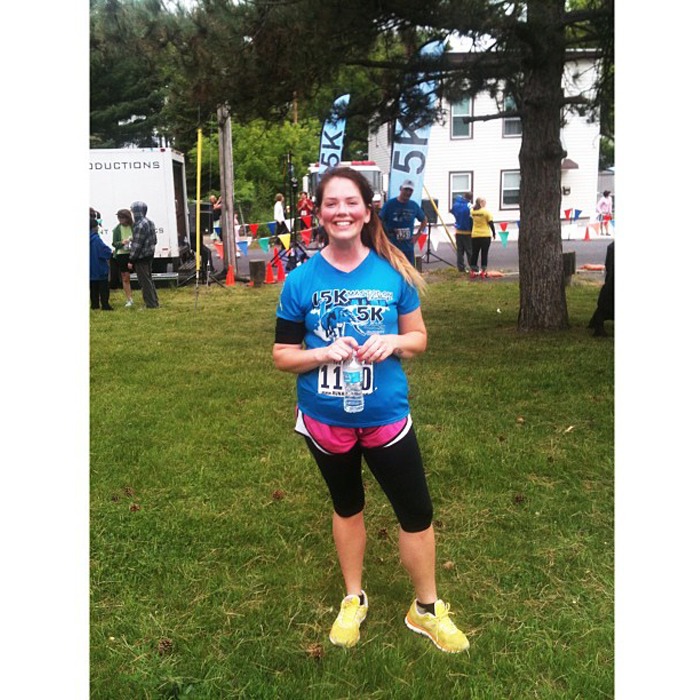 I WAS RUNNING A 5K. ME! I focused in on my music, I felt overwhelmed that this was all really real. The hills had been run, the sweat was pouring, the music was loud. I turned the corner and went downhill. I could see the beginning of the end. That's when I lost it. My shoe came untied right about now, and I said a quick prayer that the Lord would not let me fall on my face as I crossed the finish line. I hadn't stopped the whole time and I certainly wasn't about to right now. As the finish line got closer, I went faster and faster. I could see my dad, Caleb, and the boys starting to cheer and that's when I lost it. I felt like Rocky, or Muhammad Ali, or something, and since I know pretty much nothing about either of those men, I'll sum it up for you: I felt on top of the world. In that moment it didn't matter it if took me 21 minutes of 2 hours. 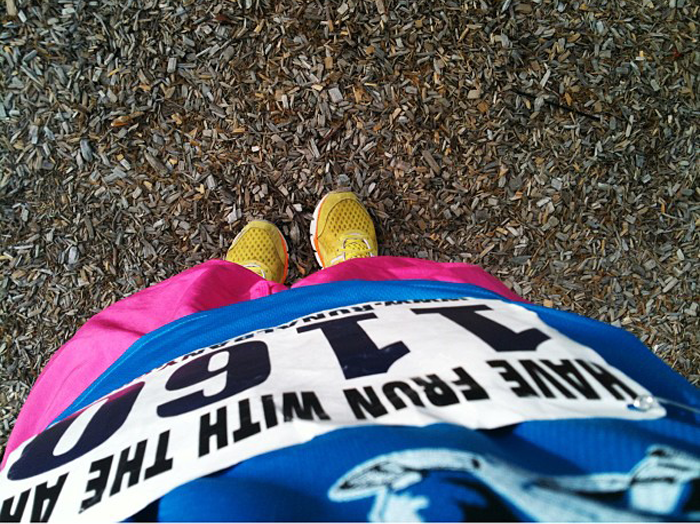 I did what I set out to do and I was about to finish this race and put a big, fat checkmark next to Run my first 5k. My eyes shot over to the time, 37 minutes. I couldn't even see the seconds cause my eyes were welling with tears and I quickly met them back up with Caleb's. I crossed the finish line and my heart burst, right then and there. I hugged my boys, my dad, and my husband. I did it. you are amazing. tears are welling & streaming down my face. being brave is something i am working on - you inspire me! Brave is the new amazing. You are the new brave. Maybe I'll do one someday?? You go girl! That is certainly not an easy thing and not something everyone would do. P.S. I do the same thing to the T-Swift song when I am in my car. There is nothing like finishing your first race and realizing how awesome you are! Congratulations Danielle! Congrats, Danielle! You did a great job writing about your experience to help inspire me and many others I'm sure! Congratulations finishing your first race! Such a good feeling crossing that line! yay! congrats!! that's a great time for a hilly run! 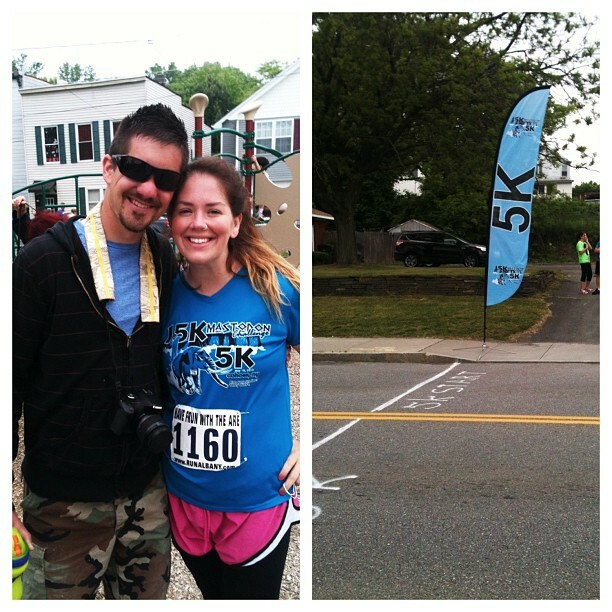 you ROCKED your first 5K mama! now you'll soon be wanting to run another...and another....and another! Congrats! It truly is an awesome feeling crossing the finish line. girl, i like your workout playlist!! :-D Katy Perry 'Firework' and 'Teenage Dream' always make me run faster!! Hey if you like some good ole TOP 40 workout music you should run to Shakira!!! Crying right now. I felt like a proud momma when I looked at the pics of you crossing the finish line!